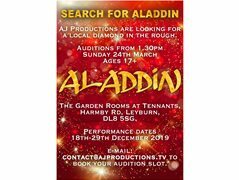 We are casting for the role of Aladdin for the 2019 Christmas Pantomime at The Garden Rooms at Tennants in Leyburn. We are looking for local talent and are providing an open call for male actors who live close to the area. Must live local to Leyburn / Darlington / Teesside. Must have a strong singing voice. Auditions held at The Garden Rooms at Tennants, Leyburn on Sunday 24th March. Audition slots must be booked.